Beatriz Socorro began her formal art training at age 10. During 5 years, she studied art with the Sisters of the Holy Names of Jesus and Mary in Montreal, Canada, where she learned drawing, perspective, the use of light and shadow to obtain depth and likeness as well as clay sculpture. Professionally, she worked as a photographer and today uses her own photos as subjects for her colorful oil paintings which are characterized by their vividness and visual impact. Her art falls under the category of Contemporary Expressionism. She definitely considers her work to be an expression of her own spirit. It doesn´t matter if you don´t have the same colors in your palette as I do. Experiment with the colors you already have and you might come up with something even nicer. Background: First apply a wash to the background. For this painting, I mixed Prussian Blue + Carmin + White and thinned it with turpentine until it became almost transparent. Using the same technique as the Pink Tulip Demo, add the dark and light areas of the flower. Leave a small space between the two colors so that when you blend their edges together, it creates the middle tone. Now, gently and softly blend the edges of the two colors. Leaves: Viridian Green + Cadmium Pale Yellow. Use the same technique on the leaves as you did with the flower. NOW ALLOW TO DRY WELL. 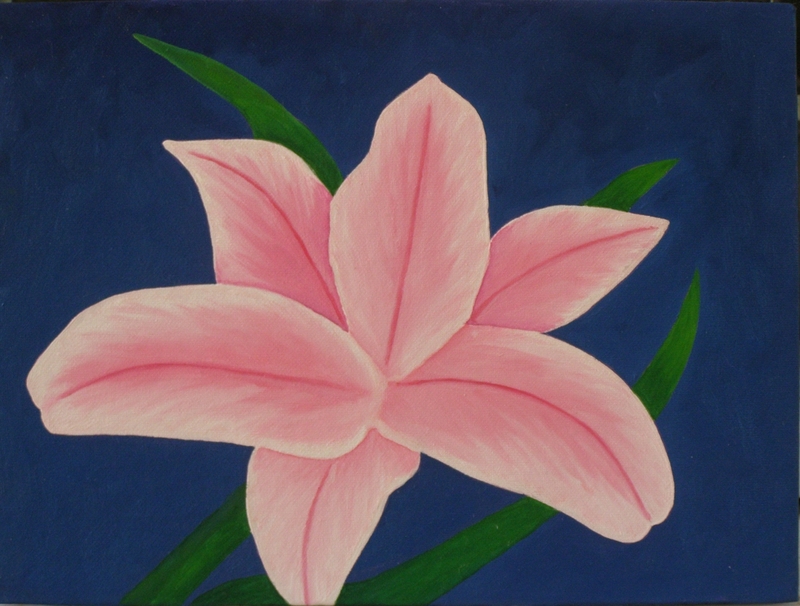 Using the same colors you used for the flower but with a much darker tone, add the red lines to each petal. To paint the lines, I used a very small “bright” brush. Don´t apply too much pressure or you could scratch the underlying layer. Then with pure White, mixed with the appropriate medium mixture for this layer (see Pink Tulip Demo), highlight the white areas of the flower. Now, using lighter and darker tones of the same colors previously used on the leaves and adding the adequate medium mixture, do the same with the leaves. Do this until you´re satisfied with the results. Remember that bright colors come forward and dark colors recede. 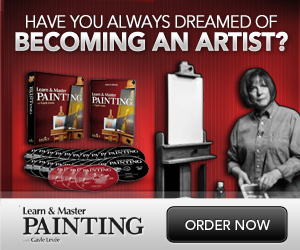 Keep this in mind to add depth to your painting. NOW ALLOW TO DRY WELL TO THE TOUCH. Always keep track of the layers of paint you have already added and use the appropriate medium mixture for each layer. Using the same color you used on the leaves, glaze the center of the flower. To make the spots on the petals, do it first with charcoal. This way, you can make corrections if need be. With the tip of a paper clip, dipped in the same color as used for the lines of the flowers, add the spots on the petals. 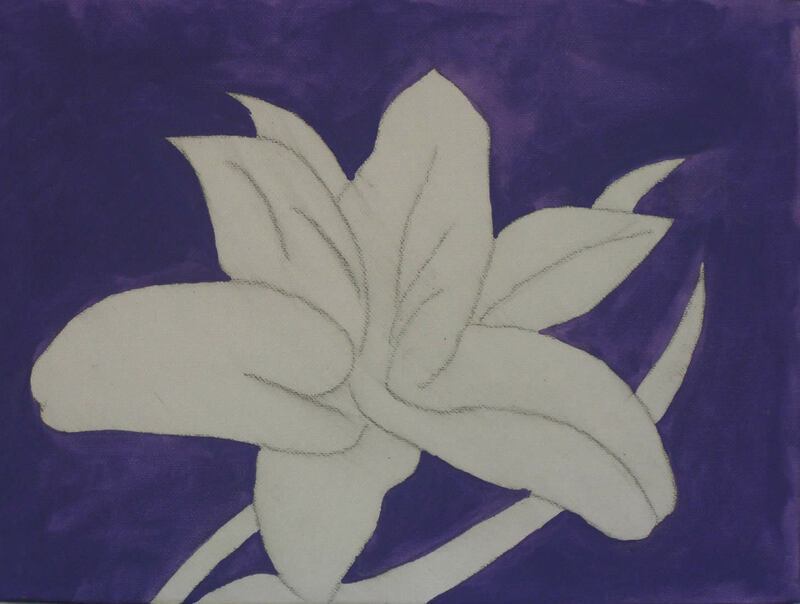 With charcoal, lightly outline the stamens where you want them to be. If you need to correct, remove the charcoal with a paper towel dipped in diluted dish-soap and then tap dry. 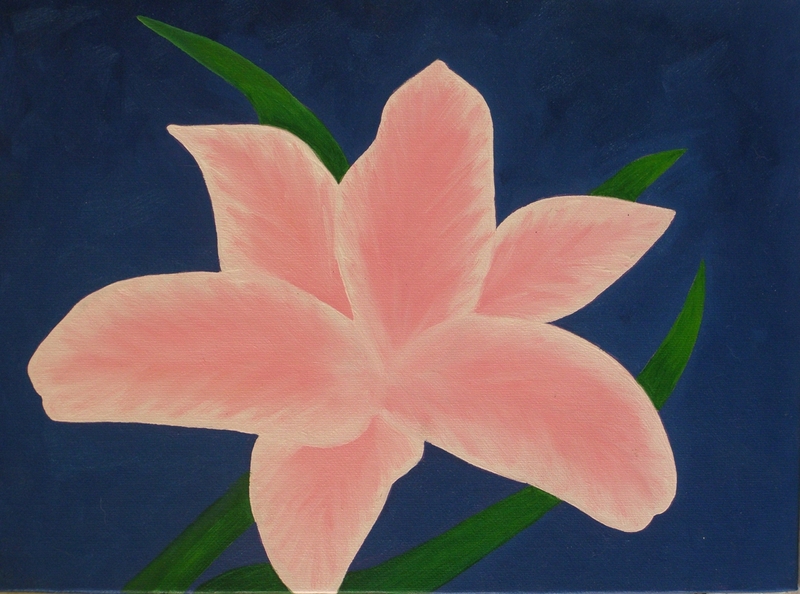 With the same “bright” brush you used to paint-in the lines of the petals, without applying too much pressure, add the stamens (using a lighter tone of the same color you used on the leaves). 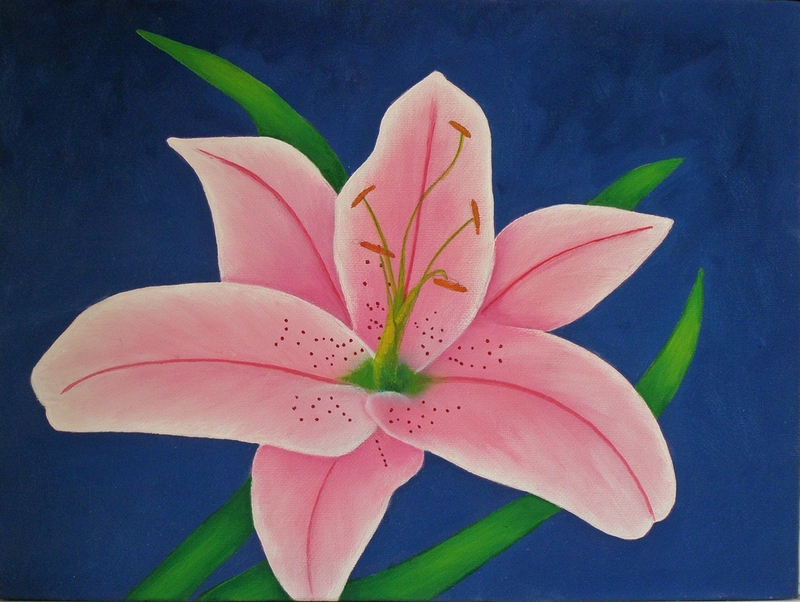 For the base of the stamens, you can add and blend the paint with a small soft brush or a brush of your preference. For the pollen, mix Medium Red + Cadmium YellowPale. Use the small “bright” brush to add the color. Note: If you see a letter missing in “Stargazer”, it´s not a spelling mistake. It´s just Google having a good time at my expense. 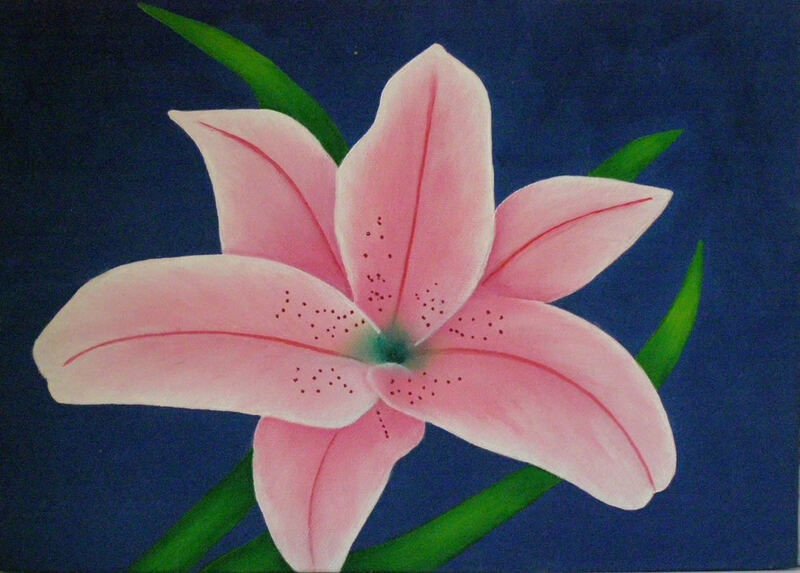 The instructions for painting the Lily were very beneficial and easy. Thank you.